GBPNZD might be in for a downtrend as price is forming a head and shoulders pattern on its 4-hour chart. Price has yet to break below the neckline around 1.8800 to confirm that a reversal will follow. If so, the pair might drop by around 600 pips or the same height as the chart formation. The 100 SMA is still above the longer-term 200 SMA for now, but the gap has narrowed enough to signal a potential bearish crossover. If it pushes through, more selling momentum could kick in. Price is already trading below both moving averages as an indicator of selling pressure. RSI is in the oversold region, though, which means that sellers are tired and could let buyers take over. In that case, support might still hold and push GBPNZD back to the shoulder around 1.9200 or the head at 1.9400. Stochastic has some room to head south but already seems to be dipping to the oversold region as well. Turning higher could add confirmation that bullish momentum could kick in. The pound is still on weak footing likely due to Brexit uncertainties. It doesn’t help that inflation reports have been much weaker than expected, adding to concerns that the economic strength could falter as the country leaves the EU. So far, PM May has yet to secure concessions from EU officials on the Irish border backstop and also present a plan that is amenable to parliament. Neither side seem willing to give way as the vote has been pushed back and would still likely lead to defeat. 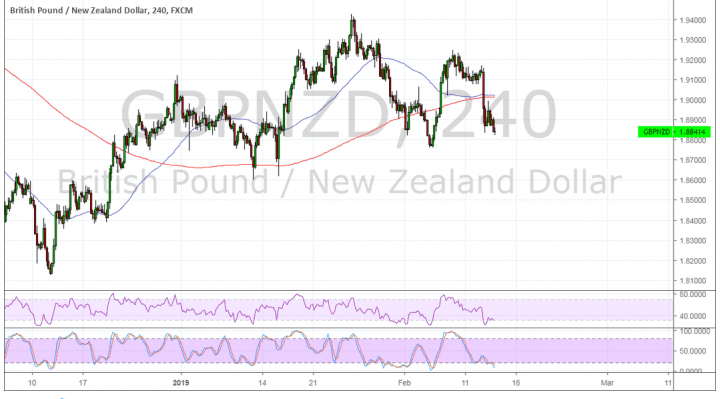 Meanwhile, the Kiwi kicked higher as the RBNZ clarified that they are not looking to cut rates soon, an expectation that has been spurred by their neighbor the RBA’s more cautious tone.